The Cisco Certified Network Associate Data Center certificationis Cisco's newest certification, covering the Cisco Unified DataCenter technologies. Written by unparalleled author and Ciscoauthority Todd Lammle, and CCIE John Swartz, this comprehensivestudy guide is essential reading for anyone preparing to take the640-911 exam (Introducing Cisco Data Center Networking), providingin-depth coverage of all the exam's objectives. In addition, itoffers expanded coverage on key topics reflected on the exam. 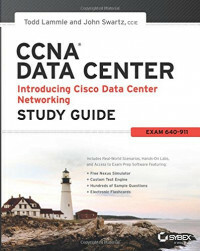 CCNA Data Center Study Guide offers you access toadditional study tools, including bonus practice exams, electronicflashcards, a searchable PDF of a glossary of terms. Plus, you willbe able to use the free nexus simulator to perform all the hands-onlabs in the book.